에 릭 슈미트(Eric Schmit) 구글 회장. 그는 이 회사 고속성장의 주춧돌이다. 이상적으로 흐를 수 있는 창업자들의 아이디어에 현실이라는 외피를 입히는 핵심 고리역할을 하는 인물이다. 투자자들을 설득해내는 것도 그의 몫이다. 서로 다른 컴퓨터 간의 소통을 담당하는 라우터와 같은 존재라고 할까. 지난주 한 국제세미나에 참석하기 위해 우리나라를 찾은 그의 주요 발언을 발췌했다. ● One person's definition of evil is another person's different definition. 선악에 대한 정의는 사람마다 다를 수 있다. 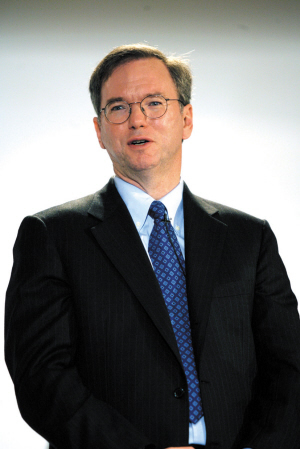 ● Our strategy allows Google to innovate very, very quickly, which I think is a real strength of the company. 구글은 빠른 속도로 혁신한다. 그것이 가장 큰 강점이다. ● Search technology has a lot of room for improvement, be it algorithms or computer architecture. 검색 기술은 아직 부족한 점이 많다. 알고리즘으로 보나, 컴퓨터 아키텍처로 보든 마찬가지다. ● Yahoo is a portal with a myriad of specialized services. What Google does is sufficiently limited. It's not really targeted at what Yahoo or AOL is trying to do. 야후는 수많은 서비스를 제공하는 포털이다. 하지만 구글의 역할은 제한돼 있다. 우리는 야후나 AOL이 하려고 하는 것을 목표로 하지는 않는다. ● Our business strategy is not to compete. 우리는 경쟁하지 않는다. 그것이 우리의 사업 전략이다. ● I see myself primarily as a technologist. But here at Google I'm primarily used as an executive who has run companies. 나는 기술자이다. 하지만 구글에서 나는 회사를 운영하는 경영자의 역할을 담당하고 있다.